These stamps are perforated with a line perforation machine; each perforation step produces one continuous line of perforation holes. This means that the sheet has to be perforated separately in both horizontal and vertical orientation. As an ideal stamp should have precise corner holes, we have optimized our technique to avoid "odd crossings" as far as possible. 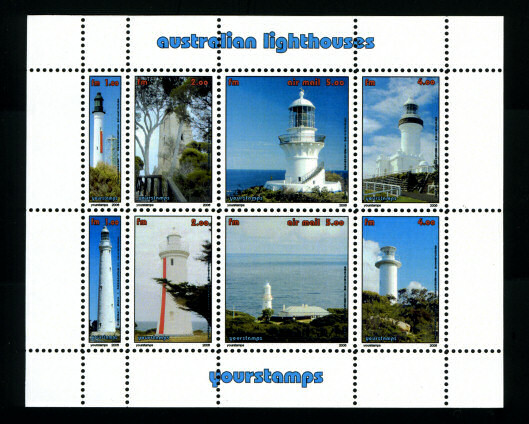 This stamp type is recommended in all cases where the image format does not fit into the 2:1 layout of fixed format stamps, or if the required size is smaller or larger than the one provided by that format. Number of stamps depends on stamp size, from 4 to 40 per sheet - calculate with a printable area of 15 by 20 cm on each sheet. Stamp size determined by jpg image size - we print with 600 dpi, i.e. an image with 600 by 600 pixel will result in a stamp image of 1" by 1" - with 2mm perforation borders on each side, the stamp size will be 29mm by 29mm (1.2" by 1.2"). There may be small deviations from this in order to fit into the perforation grid. Example 5: Sheet with mixed stamp sizes (LP-MS). Stamps may have varying sizes both vertically and horizontally, as long they fit into an rectangular grid (i.e. continuous perforation lines). 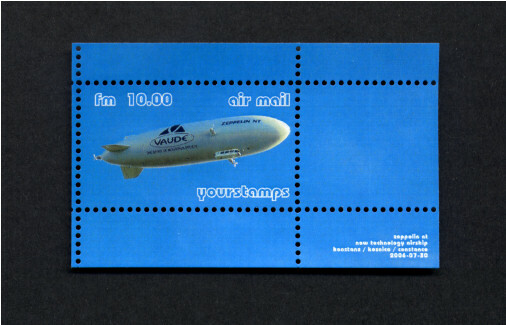 Example 6: Miniature sheet (LP-MS) containing one stamp.